Nan Whaley, Mayor of Dayton, is on the Planned Parenthood host committee for a funding event on May 8th in Cincinnati. 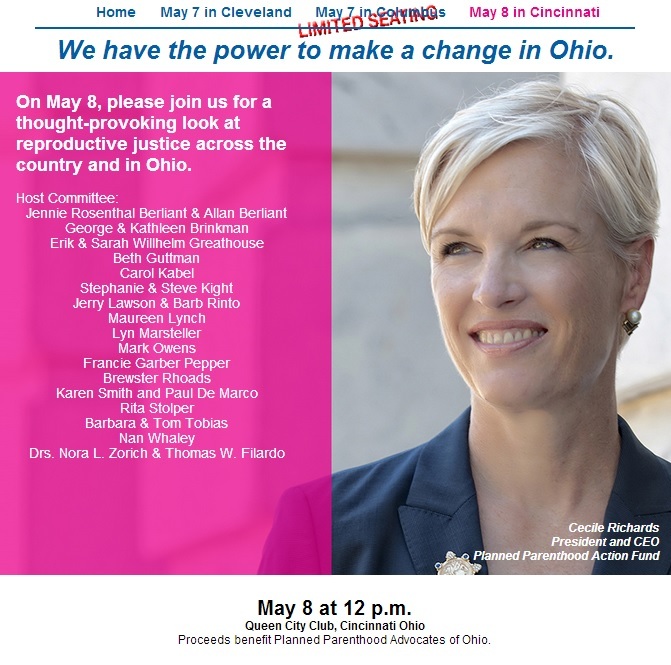 This is Cecile Richards ‘Ohio Tour’ to raise funds since the recent law passed to put Planned Parenthood on the bottom of the free money list because they are an abortion ‘provider’. She is backed by EMILY’s List whose mission statement says: “We elect pro-choice Democratic women to office“. Nan Whaley fails women by purporting cheap birth control and abortion. If there is a ‘war on women’, it’s because women like her demonstrate short-cutting who women truly are by making them subservient to the abortion & reproductive agenda. Nan Whaley has no business as Mayor to raise funds for any abortion provider that murders future voters [ironic?]. She is just another proabort who relies on blood money for votes. But she can’t stop there…she has to continue her murderous rampage against unborn Ohioans? If she can turn her back to the most innocent, vulnerable and underserved of Dayton; how can we possibly trust her to have our back? The answer is that WE CANNOT TRUST NAN WHALEY TO SERVE ALL OF THE PEOPLE. And interestingly, she hasn’t promoted her date for the Planned Parenthood event on her official Facebook page. Download the flyer to the Planned Parenthood event here. Just heard the Mayor speak at the Dayton Catholic Womens Club Saturday the 3rd…..who is she???????? Nan Whaley, she’s on the host committee for the Planned Parenthood event in Cincinnati today.